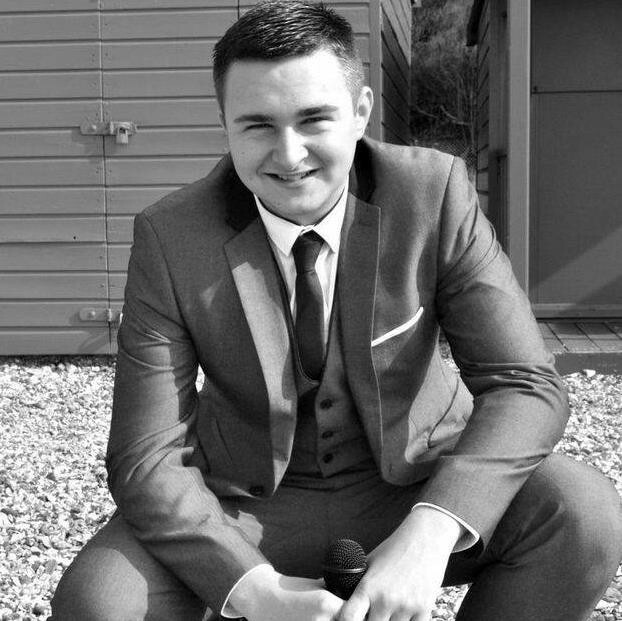 Nathan Canon is back again at Music In The City with his exciting range of songs from The Rat Pack/1950’s and 60’s/Buble/Swing sogs. An excellent entertainer hs is well worth seeing so come along at 6.30 for a fun packed session! 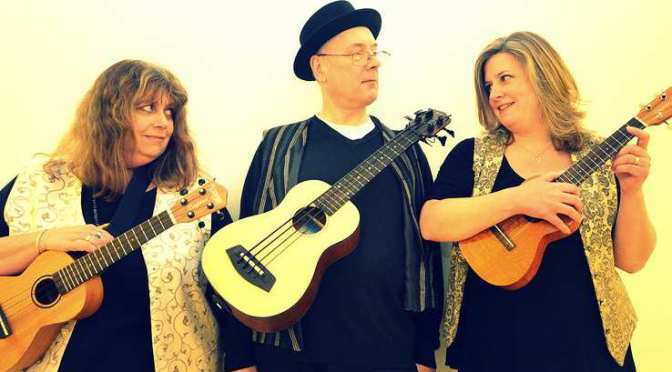 Twangdillo is a close harmony vocal and ukulele trio from Southampton’s Waterside. Rebecca, Adrienne and Philip formed the group five years ago and perform their own songs interspersed with unique arrangements from an eclectic range of covers. All three members write for the band guaranteeing sets that ebb and flow with plenty of musical variety. Pammie Moore began singing and performing publicly around September 2011, when she entered her first competition. Since then she have appeared on the radio several times, created an E.P and sang as a support to 70’s group “The Real Thing” and at an event with Sinitta. Previously she has had press coverage in The Daily Echo and TheAndGuide and has regular gigs now and have had lots of publicity. Pammie is a regular performer with “Music in the City” festival. Jim Chorley is an Acoustic/Folk singer-songwriter. Originally from Southampton, he now lives in the wilds of Winchester in Hampshire. Brian Hooper and Jeff Henry write and sing about life, love and Southampton. Veterans of the local folk scene, they have gathered lots of songs about the city since their “Southampton In Song” CD (Forest Tracks, 2006), and they led the White Star Line-Up with the CD (Wild Goose, 2012) and live show “Look Out!” (Southampton’s Titanic story). They sing with guitar, mandolin, humour and harmony and invite you to join in. 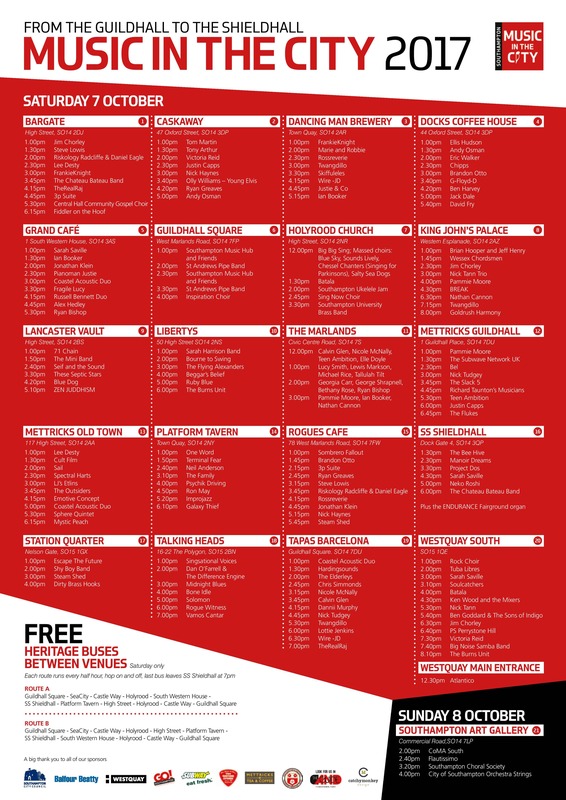 View all our venues for our 2017 Music in the City Southampton event. All venues are for Saturday 7th October, except for the Art Gallery which is the only venue for Sunday 8th October’s performers.